‘First Taste of Home’ was born out of a combination of annoyance and my sometimes oddly applied sense of responsibility. In this particular case, it wasn’t annoyance at a label, or annoyance at an ingredients list – it was due to one of our ingredients having changed texture. 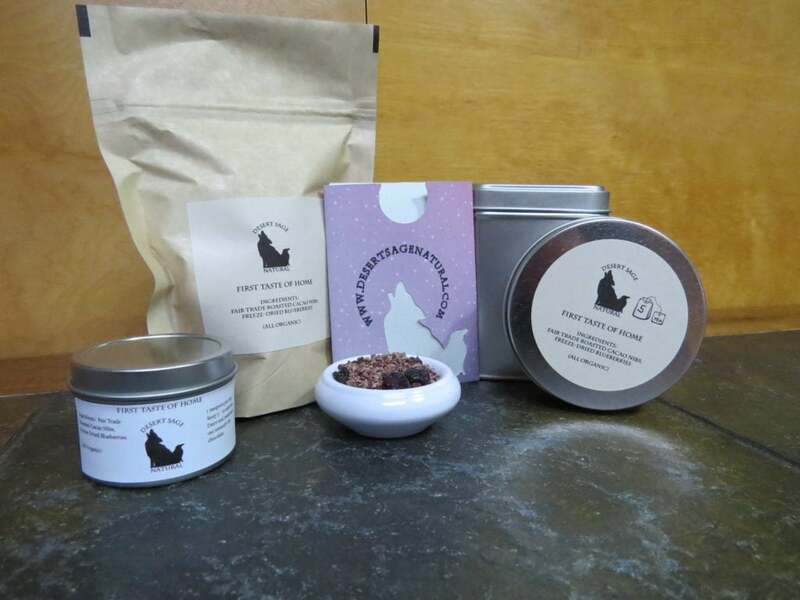 I’d received an order that included our Javert’s Choice – our dark chocolate blueberry cocoa. Orders for the strawberry and blueberry cocoas are a bit complicated right now as they involve freeze dried fruit powder. Which, so far, we’ve not found a way to keep so that it has any amount of longevity. Not from the “going bad” angle – but the powder on its own seems to turn into a fruit brick within a couple of months.1In fact, most of the time it doesn’t even last as long as the supplier says it should. Due to this we extended the fulfillment time on them, and decided the powders would be ordered when needed, and then we’d experiment with new ways of storage. Eventually we hope to figure out a method that gives those powders some longevity. Anyway, with it being the Christmas season, I contacted the customer to let her know – as I know that not everyone reads the entire listing. Turned out that it was, indeed, intended to be a Christmas present. So I ordered the powder, and waited impatiently for it to arrive – in the hopes that I would be able to get her original selection of cocoas out to her. It arrived. We’ve had some issues recently with ingredients being reformulated, I’ve actually had to entirely downcheck one of our cocoas2 because of it. This has caused an understandable level of paranoia. That paranoia led me to blend a test, to make sure the cocoa still functioned as it had originally. The answer was “mostly.” I wasn’t quite happy with it. Still tasty, still cocoa, just took a bit more effort than I remembered to get it stirred into the hot milk, and there were more cocoa dregs than I remembered. There is a slight chance this is just because I am not as good at cocoa stirring as Mister Tea – he is a true master of that art – but either way I was mildly unsatisified. I contacted the customer again, to let her know that I didn’t feel it was quite up to our usual quality, though still in range, and asked if she still wanted it. But I was still a bit grumpy about the whole thing. So, I decided that I wanted to be absolutely certain that the taste of dark chocolate blueberry was a part of their Christmas. I have blueberries. I have cacao nibs. Cacao nib tisanes are amazing. So, I blended a new tea. This one. Just cacao nibs and freeze dried blueberries. And it was decadent and wonderful and… definitely passed muster. It took longer than I liked to get Mister Tea to test it as well, our schedules of late have not been well-synched, and I am generally already a somewhat mobile crunchy puddle of exhaustion and pain by the time he gets home – but it did get done. And the bliss on his face at the first sip made me positive I’d nailed it. “Did I ever tell you about the first time I tasted chocolate blueberries?” I thought he had, and stated as much. However, I was remembering the first time he’d had chocolate blueberries around me, which was not the actual first time. The first time had been many many moons ago when he came back to the States from Kuwait. Now, I had heard the first part of the story many times. And understandably so. I can imagine there being nothing quite like being dressed for maneuvers in the desert, and having your first stop in the US be… Bangor, Maine. Cold. Snowy. Very much not at all like a desert. However, there was another page or two to the story. Apparently, while going through all the things you have to do to reenter the country, they were able to wander a bit, and there were a couple of interesting things scattered around the airport. Mister Tea picked up some dark chocolate blueberries – trying them for the first time – and having that exquisite flavour be the first thing he tasted on home ground. The name leapt directly out of the anecdote, and the decision to make it a ChariTea followed almost as swiftly. We’ve decided that it will contribute to the USO – as during his time in the Army, they tried to give the soldiers little tastes of home and normalcy throughout. He talked about how every call home he was able to make while in Kuwait was dealt with by the USO, and how they had a little receiving area with games and space to relax and… that it was a space that offered a bit of respite and balance. He’s spoken a few times to the fact that most people think of the big flashy things the USO does, but that the smaller actions that don’t get the press mean quite a lot to people in our military. If anyone has any advice for storing freeze dried fruit powders, I’d love to hear it. Persephone’s Passion. Pomegranate. Hopefully I find another way to create the taste. This entry was posted in Chocolate, Fruit, Simply Tasty Teas, Things We make (Tea, Coffee, Cocoa) and tagged ChariTeas, Chocolate Tea, Desert Sage Natural, Fruit Tea, Fruity Tea, Organic Chocolate Tea, Organic Fair Trade Cacao Nibs, Organic Freeze Dried Blueberries, USO by DesertSage. Bookmark the permalink.